Dive the Sea Tiger or the YO-257, some of Oahu’s premier deep wreck dives, followed by a shallow dive on one of our gorgeous reefs like Kaiser’s, Turtle Canyons, Horseshoe, Kewalo Pipe, and Secrets. The wreck dives are 80-100’ dives, so you should have experience diving at depth. The reef dives are 30-50’ dives perfect for a follow up to the deep wreck dives. Two tank dive for certified divers. One tank dive for discovery divers. Evidence of dive certification is required from all visitors wishing to participate in a certified dive. All necessary diving equipment, light snacks and refreshment, and Waikiki hotel pickup and drop-off is included on this 4-hour tour. You will be picked up from your hotel in Waikiki in an air-conditioned 10 passenger van and transported to the boat harbor, only a ten-minute ride away. The Sea Tiger, Hawaii's deepest recreational diving wreck. The 189' Sea Tiger rests in 123 feet of water while the superstructure and deck are at depths of 60-90 feet, offering great diving for certified divers over 14 years old. The YO-257 & San Pedro. These two ships lay side by side with about 50 yards between them. The YO-257 rests in 115 feet of water while the superstructure and deck are at depths of 70-90'. The San Pedro is a bit shallower, 65-85'. This site can experience strong currents and is only dove when conditions are ideal. Once at the boat harbor you will meet your scuba Instructor for the day and be personally fitted with all the required scuba equipment that you will need. The boat departs the dock and makes the run to the day’s first dive site. While underway, the dive instructor will brief you on the day’s activity, going into detail about the site you will be diving, the water conditions for the day and what marine life you can expect to see. Endemic tropical fish, octopus and the Hawaiian green sea turtle are not uncommon sites. Once you arrive at the dive site your instructor will assist you in donning your scuba equipment. 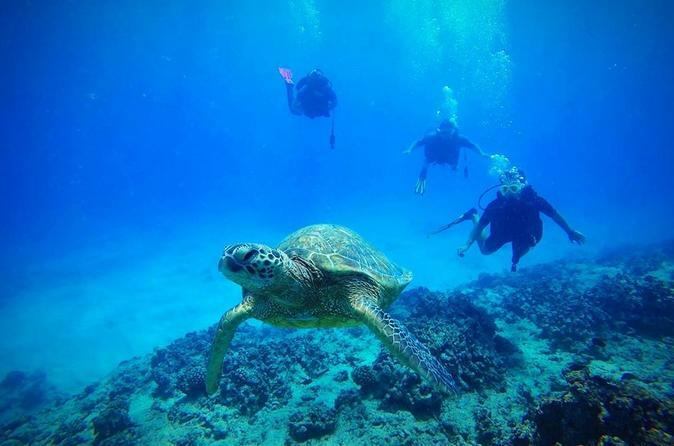 Your instructor will then take you on a guided tour of Hawaii's underwater landscape. Marvel as you fly weightless through the water over colorful coral reefs teeming with beautiful marine life or swim through the majestic remains of one of Oahu's many sunken wrecks. When it’s time to return to the surface, your captain and dive instructor will assist you in returning to the boat, where there are drinks and snacks provided. After a short interval on the surface, perfect for working on your tan, you will return to the underwater world to experience another amazing scuba dive. After a short ride back to the harbor you will be returned to your hotel, being left feeling exhilarated from a truly once in a lifetime experience.